Access. Various river access experiences are being considered. Healthy Habitat. Restoration of the north riverbank could enhance riparian buffers and improve water quality, supporting salmon, steelhead and pacific lamprey. Use. 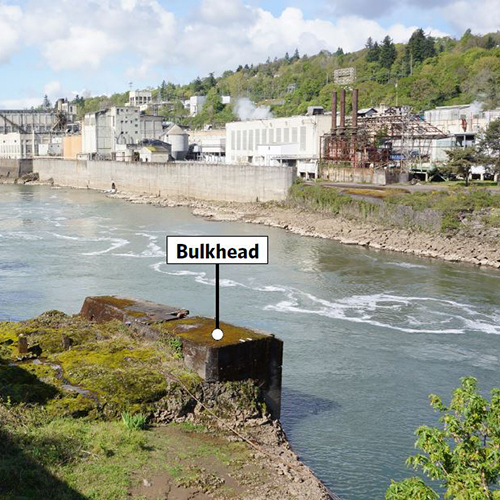 Explorer trails could incorporate the reuse of existing industrial structures such as the concrete bulkhead. 1. Limit access to the river and restore habitat along the shoreline. This option does not provide access to the water; viewing only. It would restore the natural edge of the river to increase habitat area, including aquatic alcoves for fish and other species. 2. Provide a small gathering space, such as steps, along the shoreline to allow people to get close to the river and put their toes in the water. This could be a place to launch small, non-motorized watercraft like kayaks, canoes, and paddle boards. It also provides a potential portage connection below the falls. 3. Provide a boat dock; this is not a boat ramp, but rather a mooring dock that could provide access for small fishing boats, motorboats and non-motorized craft. 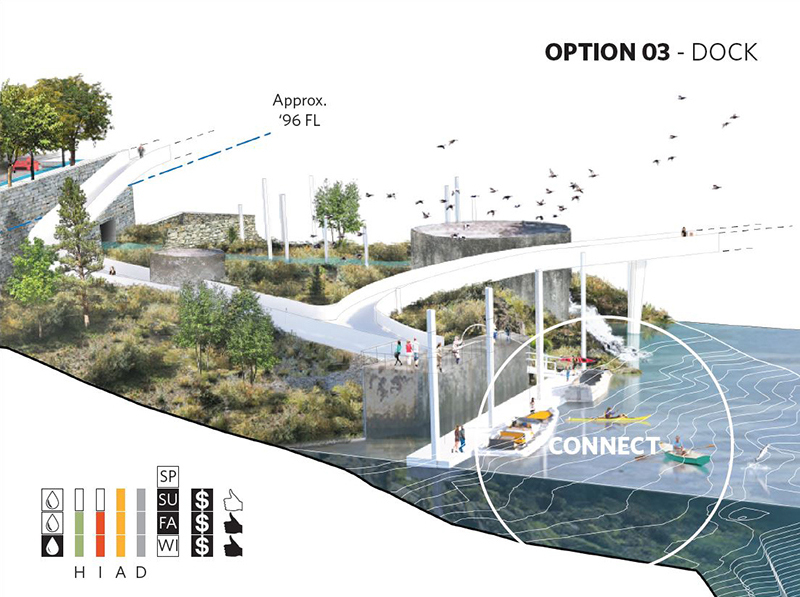 As we move forward in design, these options can be combined, modified and hybridized to craft the riverwalk preferred design. Our design team will consider community feedback along with technical information such as river conditions and flood impacts. 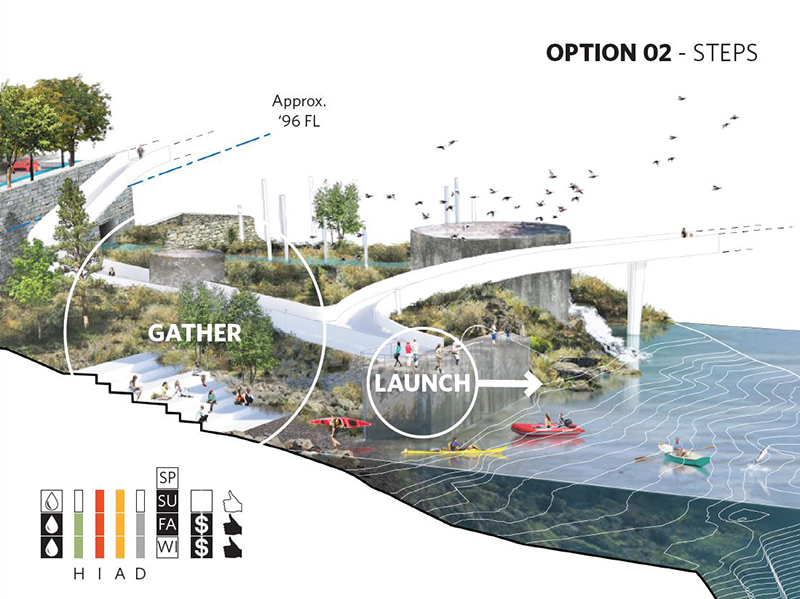 The feedback received at the event and on the online survey showed a high level of support for option 2, a non-motorized boat launch and gathering area. The habitat option and dock option both received some support as well. The design should accommodate a variety of uses, such as watercraft, fishing, swimming and enjoying nature. There is broad support for water access, including the ability to launch non-motorized craft. There is some support for motorized craft, but also concern about safety, noise, pollution and conflicts with other uses. 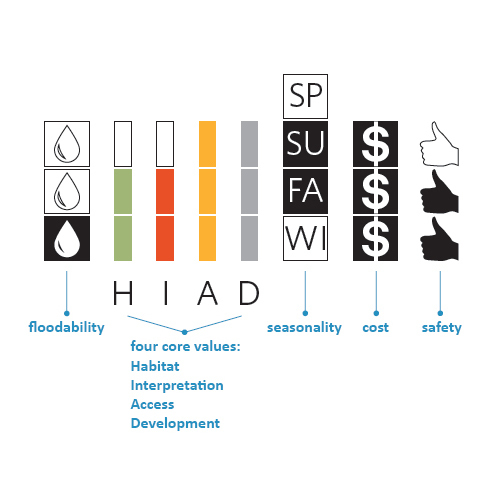 Consider accessibility for different users (widths of trails, materials, etc.). Flooding is a major consideration. Parking is needed but should not detract from the site.